After hearing from friends who’d been in a class at the Pittsburgh Glass Center I’d been looking forward to making it down there myself. I wanted to take Cameron, but from their site it looked like she wouldn’t be old enough to attend most of the classes. Luckily they do “Make It Now” quick classes with holiday themes, and those don’t have an age restriction. 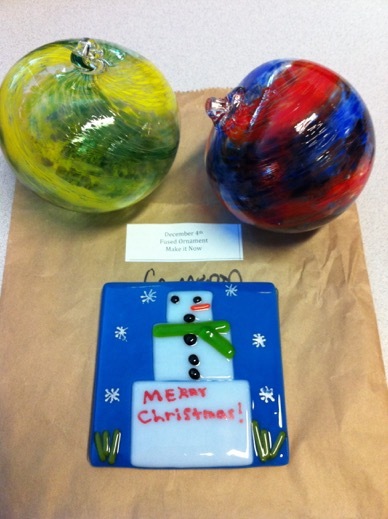 I signed us up for the blown glass ornament class as soon as I could and started counting down the days until we went. 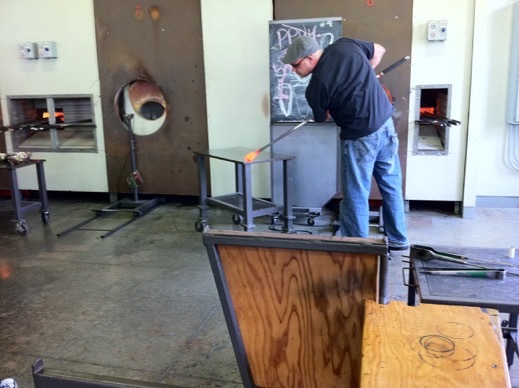 It being such a quick, busy, and kid-friendly, class we didn’t get to be too close to the furnaces or the hot glass, but we did get to pick out our colours and do the blowing. I chose green and yellow, and Cameron chose red and blue. Our teacher did all the hard work but it was still a lot of fun. We’ll be going back for sure. On the way out we spotted signs for a “fused glass” glass that was also open for kids. This is where you take a glass tile and arrange various pieces of glass mosaic fashion on it, with a dab of glue to hold it in place. They then heat the tiles in the kiln to fuse the glass together. Cameron chose to do a square snowman and it came out perfect!